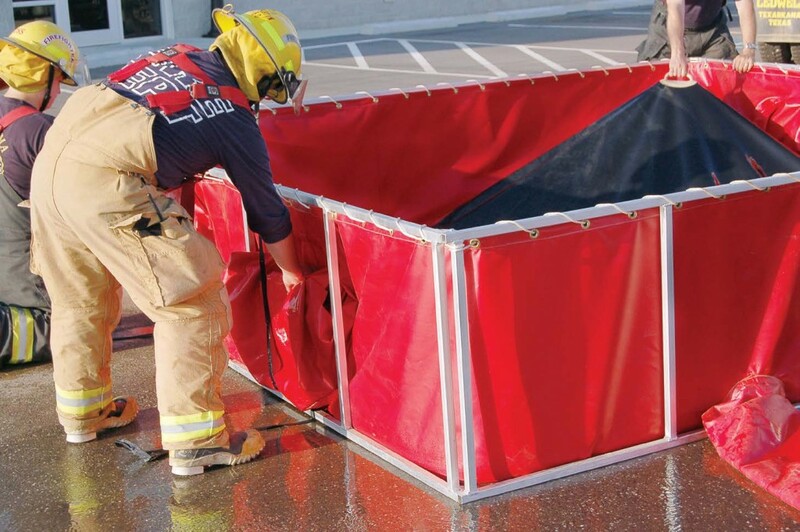 Now in its 11th year, the experience behind Husky Portable Containment has propelled the responsive company to the premier leadership position in fire industry innovation. First on the market with Easy Lift Handles (U.S. Patent No. 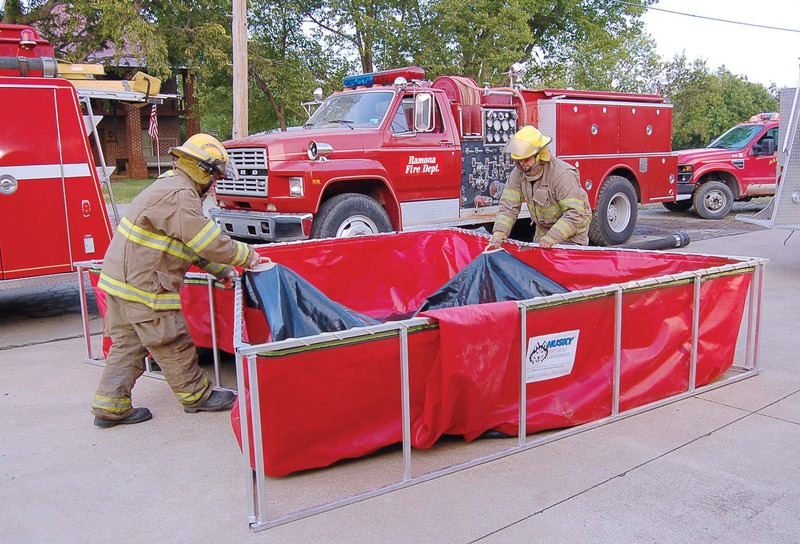 8,746,478 and other patents pending) for portable water tanks, the company is now excited to offer the biggest fire-ground solution on the market today: the Pro500™ Tank Liner. This new generation replacement liner is in high demand because it adds up to 500 gallons of water while still fitting a customer’s existing frame — a tremendous cost-saving advantage. 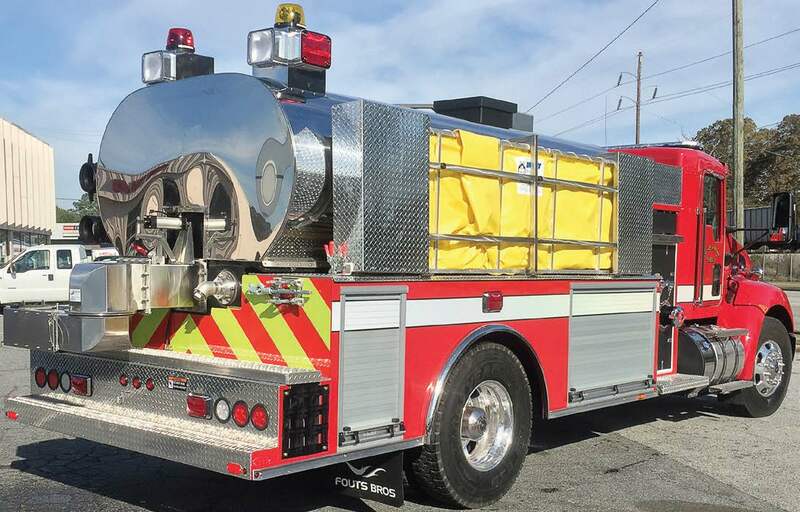 To create the Pro500™ Tank Liner, Husky welded four exterior bladders to a standard tank liner and offers the option of deploying a single bag, two, three or all four. When they’re not necessary, deploy none at all. Flexibility like this allows the call to be made on the fire-ground regarding how many there’s room to deploy and what the expected water volume need will be. Holding more water on the site is crucial to the water shuttle movement: More is better. The versatility of the Pro500™ Tank Liner design allows it to be installed in the Skinny® Tanks. These tanks are built with one-lane, back roads in mind. Set up the Skinny® Tank on one side of the road and all-important fire tanker traffic will be able to pass without affecting the operation, bringing water from both directions. Add the PRO500™ Tank Liner and decide how much extra capacity can be added given the landscape around the scene. Extensive research was carried out by Husky to determine the optimum size of tank expansions. As a result, firefighters can be assured that stability won’t be compromised even if all four bladders are deployed. Those studies and tests revealed too large of a bladder with too much volume will compromise the structural integrity of the tank and, most importantly, the safety of those around it. Extremely large-capacity bladders coming off the tank are capable of dragging the tank and anyone around it into a ditch or drop off next to the tank. The PRO500™ Tank Liner can be altered by adding another bladder or two, achieving 125 gallons to 250 gallons above the already 500 gallon capacity; but Husky suggests the bladders stay at its recommended lengths. Husky Portable Containment Company refuses to put equipment and lives at risk by overstepping that threshold. Husky can manufacture these tanks in several liner fabrics, including its exclusive EXLON® material, which has the best abrasion qualities for a 22-ounce product in the industry. Combined with the company’s patented Easy Lift Handles (U.S. Patent No. 8,746,478 and other patents pending), the liner is already at the vanguard of the industry. Even so, “the real advantage to this is that people can use their current frame, yet add capacity,” said Jay Claeys, president of Husky Portable Containment and co-owner of the company. 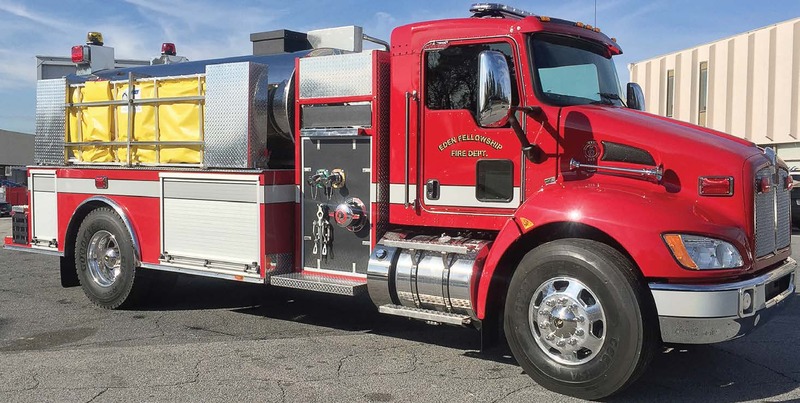 Fire departments across the country seem to agree, especially those in rural areas with limited budgets handcuffing them on what they can spend for new equipment, such as a new frame. Th e Pro500 Tank Liner™ is only the latest in an unbroken line of pragmatic and dependable firefighting solutions from Husky Portable Containment. Thanks to another superstar product in the Husky lineup, that added volume doesn’t require the purchase have to buy a new rack. 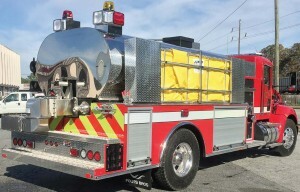 Although the company excels at creating custom racks, the Pro500 Tank Liner™ fits existing ones. For rigs that are in the market for a new rack anyway, though, consider the fact that Husky is now building portable tank racks that mount on the side of the truck. These lightweight, sturdy racks feature a manual release mechanism and are designed for easy installation, perfecting an already-existing product. They’re made from aluminum or stainless steel and fully enclosed: Add windbreaks only, or choose the most economical version with just the exposed framework. A quick-installation, bolt-in item, all Husky portable racks are also TIG welded; and they’re manually operated, putting them within the budgets of rural and smaller departments. “We keep our pricing in check,” said Claeys. Effectively, Husky puts out a better product at a price that’s accessible to every department. Husky Portable Containment’s Environmental Products division is no less a leader in heavy-duty containment berms that stand prepared to meet the challenge of extreme temperatures, heavy use and dangerous substances. The company received its most recent patent for Super Berm (U.S. Patent No. 9,243,415), a product highly utilized by the military. The Super Berm is effective in many industries, including the U.S. military, aviation maintenance, fleet washing, agricultural companies, etc. Anywhere secondary containment is needed, the Super Berm has proven its durability. Husky has put a premium on research and development, bolstering its reputation as a leading innovator. Also, it’s top-notch quality control team isn’t happy with anything less than a zero percent failure rate, and Husky boasts the best warranty in the business on all of its products’ welds and seams. “It ships out and something happens, we take care of it immediately; and if that means replacing, it we do it,” said Claeys. Dealing with Husky is a pleasure for one more reason: its capable and friendly customer service. To see just how reliable the Pro 500™ Tank Liner, portable tank racks and Husky Super Berm products are, contact a Husky Portable Containment representative today at (800) 260-9950.